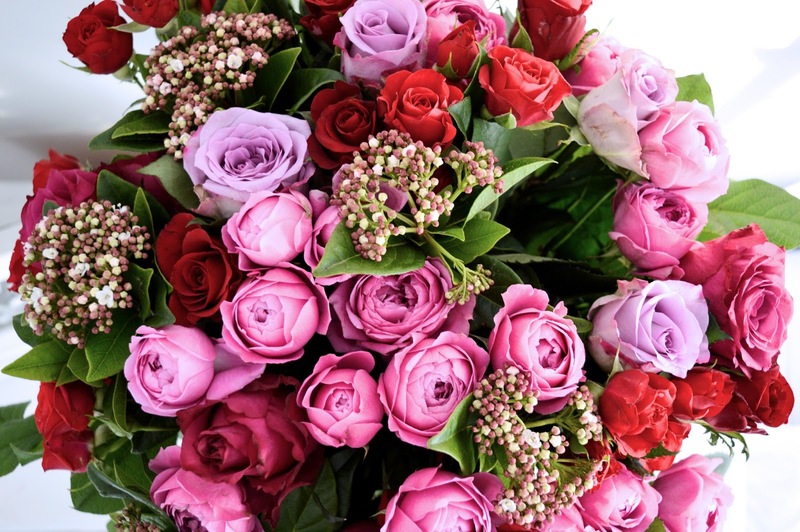 Valentines Day Blooms - Cliche, or a Grand Gesture? With Valentines Day just around the corner, everyone is thinking of grand romantic gestures to present to their other half. From looking at ridiculously expensive restaurants, to rose gold watches, rings from Tiffany's, and chocolates costing the same as a Sierra Leone diamond - what does a grand gesture mean to you? I used to be one of those people who wanted the world when it came to love: I wanted the expensive gifts, dinners at fancy restaurants, romantic retreats with spas and flowers on the bed. And I was extremely spoilt by my fiancé who went above and beyond whilst we were 'courting' - when did all that disappear, huh? Nah, I'm only kidding, he's still a good egg even after nearly 4 years of putting up with my temper tantrums and wild dreams, he still manages to find ways of spoiling me. But seriously, thinking about Valentines Day and relationships (especially on Instagram because you know, everyone's relationships are so perfect and full of helicopter rides, never ending champagne and kissing whilst watching the sun set over the Alps) - what does a grand gesture mean to me these days? I'll trade dinner at a fancy restaurant, and take coming home to a surprise meal of his signature 'Nandos' chicken with sweet potato fries, and extra hot sauce that he picked up just for me. I'll trade wild nights out filled with champagne and black tie dress codes, and take one night of just sitting next to him, watching crap TV and talking about what happened during our days. I'll trade expensive jewellery, and take waking up to him every morning and falling asleep in his arms every day. You see, I've stopped thinking that grand gestures are BIG and EXPENSIVE, but rather small things that just make your heart smile. You know at this point in my life, even have him offer to go grocery shopping with me will be a grand gesture - because carrying heavy bags is a killer when you're on your own! 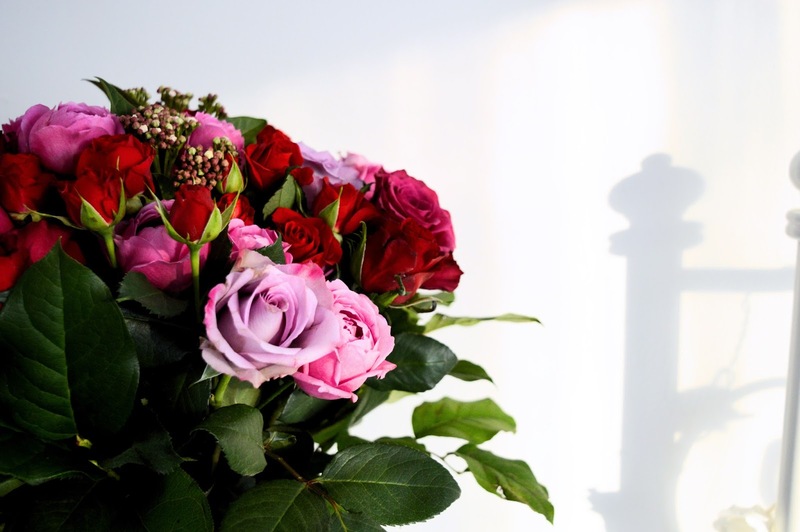 He said to me once that as long as he's around, I'll always have fresh flowers around me. 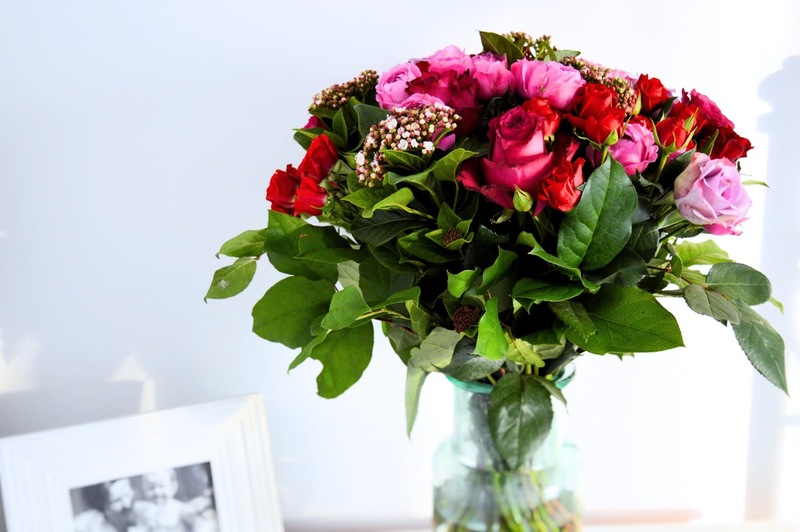 I love fresh flowers - I can never keep a plant alive for longer than a month, so a bouquet of flowers is perfect! Plus it makes the house look beautiful. And although he is so, so good at keeping this promise - I did get a surprise delivery from Moonpig.com just in time for Valentines Day. This beautiful 'Devotion' bouquet from Moonpig.com is the most beautiful bouquet for Valentines Day - it genuinely brightened up my day when it arrived. 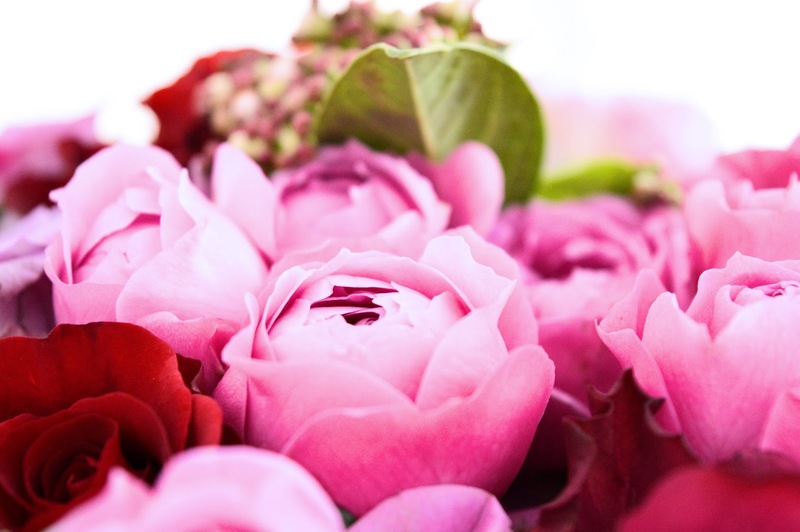 A mix of beautiful roses, one variety which look like little peonies, and greens that break up the colours - you can't go wrong with this bouquet. The delivery arrived on Friday evening, about 6pm actually, so I was at home to receive it. The bouquet was HUGE. Honestly, it was the most beautiful and one of the biggest bouquets I've ever received. Now we've just been talking about big and expensive not being that important, but when you do get a treat like this, you can't help but smile. The bouquet lasted about a week, and once some of the flowers started to die, I split the bundle into several smaller bouquets to make the most out of the flowers! And some have even survived up until week 3! I used to think of Moonpig.com as just the brand with the catchy jingle, but now I have a new found admiration for their service. 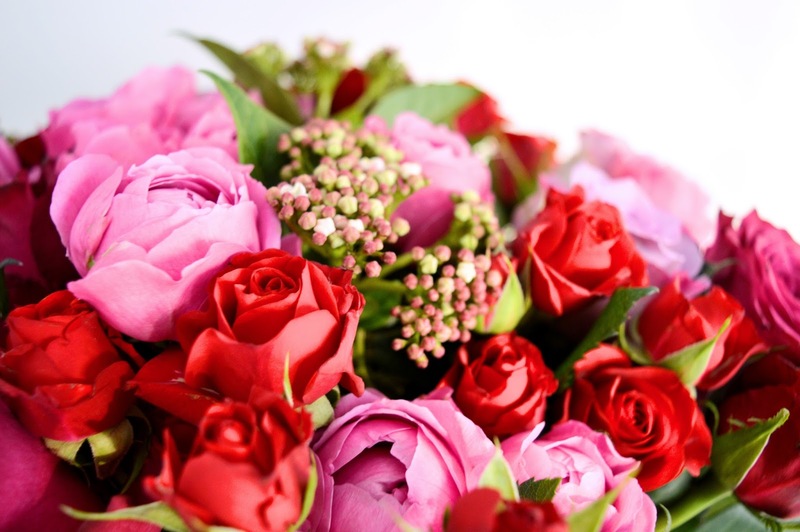 You can buy cards, flowers and even gifts for your Valentine - but before you start filling up the basket with random gifts you think your Valentine would like, I urge you to think what is going to be a grand gesture for your loved one? Is it a bottle of expensive champagne, or is it a bunch of red roses? Is it dinner at a swanky restaurant or your lovers favourite meal cooked by your hands? Is it a spa weekend away worth £200 per night, or a long weekend getaway in a basic but cosy cabin worth £25 a night? Whatever it is, grand gestures are your own personal thing, just between the two of you. What do you class as a grand gesture from your partner? Comment in the box below - I'd love to know! I think I've always kinda like the idea of grand gesture but in actual fact I get embarrassed by it - if that makes any sense?